Nicknames | Stoat – Where? Having been here two months, I’ve now acquired two nicknames. 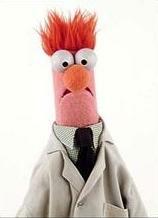 I’ve been christened Beaker, after the tall, thin muppet with a big nose. Fortunately, it’s only used when people are drunk. Unfortunately, that’s roughly 50% of the time. It’s probably my fault, as it was me who mentioned the similarity first, but I didn’t expect to be taken seriously. Thanks Trev. People have already begun noticing that I drink pretty slowly, and so my other name is Captain Half Cans. Apparently this is a Canadian nickname given to people who have difficulty finishing their drinks. Anybody who knows me knows that this is a tremendous slur on my drinking ability, right? Right?